The tour was quick, crowded and pretty standard. It started off with a quick film about the history and the 3-part-mission (which I really admired) of Ben and Jerry's and then our lively tour guide took us through the plant for the eight step process of making the ice cream (each step was labeled in the factory room as we looked down from the catwalk and she talked us through it). Our tour ended with a small scoop of strawberry cheesecake ice cream. I couldn't take pictures for you on the actual tour, but I did manage to get a couple on the grounds and some photos-allowed sites. Bethany coming out of a carton of ice cream? "a collector of ice cream paraphernalia" eh? Do we get a peek? 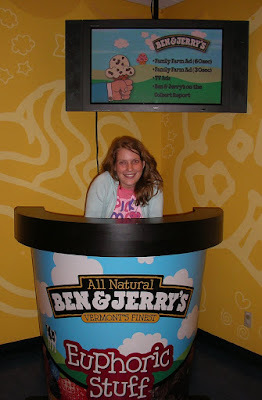 I totally agree about the Ben & Jerry's tour - I was disappointed. 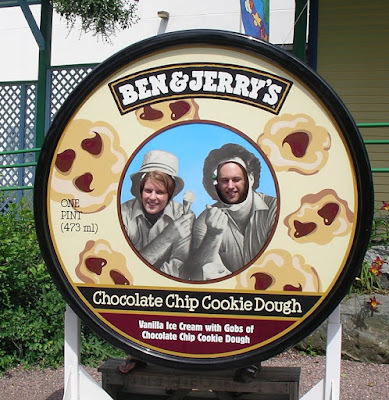 Love the ice cream, the tour was weak.